When friend and food blogger Jen Stevenson of Under the Table wanted to start her own writing business, she came to me asking advice about collateral. 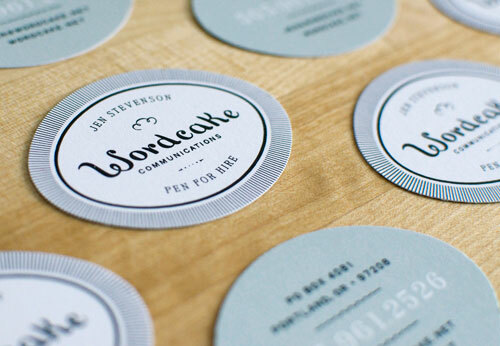 She had chosen Wordcake Communications as her business name and needed a logo, business cards and a simple website to get the business going. “I was thinking I could have a big cake, with the word Wordcake on it!” she said, giving me creative rein with a theme. I replied with a somewhat muffled “Let’s see what we can do with that…”, and got to work. Riffing on the idea of frosting, I found this typography sample in an ornaments and borders book and transformed it into Wordcake. The idea of a sophisticated take on a “cake on a platter” appealed to me since Jen is the epitome of a hostess with the mostess, even when she is stuffing your gullet with stinky cheeses and sweet confections. However, Jen wasn’t rolling in dough from creative writing (yet), so an economic solution was needed that would still help her stand out. 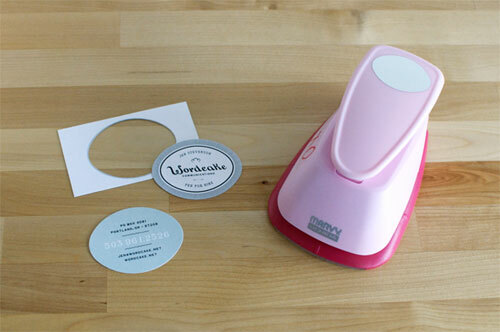 I scoured the internet for an oval punch that could take the place of a diecut. 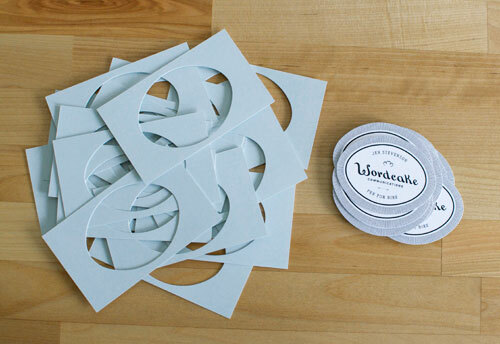 Turns out, crafters have thought of almost everything, so after a bit of sleuthing I found several oval punches, perfect for the miniature platter shape that her business cards would become. The cards were printed digitally and then hand punched by Jen in about an hour, after which she claimed she’d sprained her thumb. I told her she would have to toughen up, because once The Onion started calling and she had to churn out snarky story upon snarky story in record time, her thumb would have no reprieve. 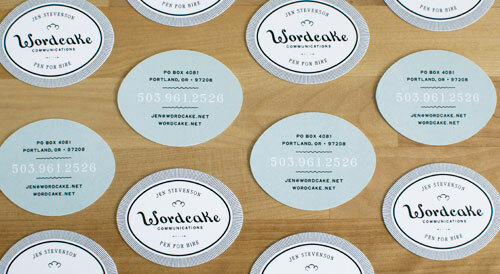 Hey, those are the cutest business cards I’ve even seen! Mette, you are some kind of genius!! PS: I still have carpal thumbal syndrome from that pink punch.